by Jack Fisher OPB/EarthFix July 25, 2018 4:45 p.m. | Updated: July 26, 2018 7:33 a.m. | Portland, Ore.
Northwesterners are hearing a lot about mountain lions lately. Since May, an extremely rare fatal attack in the Washington Cascades, a Willamette Valley pool party interrupted by a wandering cat and a viral Facebook video of a mountain lion lounging in a southern Oregon woman’s living room have made headlines across the region. Are the Northwest’s mountain lions acting out of character this summer? The Oregon Department of Fish and Wildlife’s Derek Broman says no. But they are adapting to a gradual shift in their range. And when mountain lions move into areas where people aren’t as accustomed to seeing them, it can lead to more sighting reports, news stories and interest on social media. “They get more attention because they are unusual,” Broman said. In May, the Seattle area saw a fatal cougar attack. Two cyclists in North Bend, Washington, were attacked — one fatally — by a mountain lion, in an incident that a Washington Department of Fish and Wildlife official called “incredibly abnormal.” A necropsy performed by Washington State University released last week indicated that the male cat was lean but not emaciated. “The cause of aggressive behavior reported in this cat was not evident,” the necropsy found. Just this week, Springfield residents had their own cougar encounter. 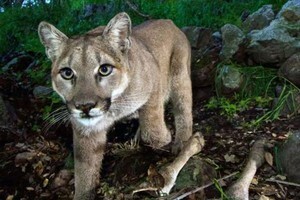 Upon spotting a mountain lion in their backyard in the middle of the afternoon, a group of teenagers called the police. With the help of a local game tracker, the animal was located and euthanized. Officials expressed concern about the cat’s uncharacteristic daytime activity and the normally skittish animal’s apparent disregard for human presence in the area. 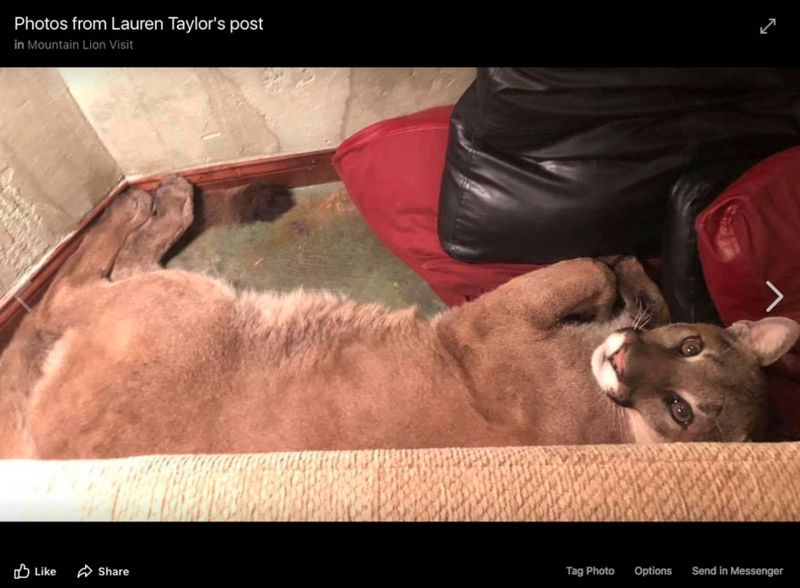 And in early July, an Ashland woman posted on Facebook about a strangely amicable mountain lion encounter in her home. Screenshot of a Facebook photo. It is one of several images and video clips posted to Facebook by an Ashland woman on July 7, 2018, along with a post describing an amicable encounter with a cougar inside her house. for living and recreating in cougar country. If you see a cougar in the wild, stay calm. They will often retreat if presented with the opportunity. Stand your ground, maintain eye contact, and speak in a loud, firm voice. Consult ODFW for more details.